The word on the street says that the fried ice-cream at Holy Basil is what makes them so popular. While this is true, there is more to this restaurant than fried ice-cream that has people lining up and waiting to be seated at a table. 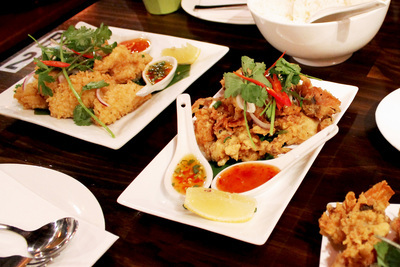 This cosy Thai and Laos restaurant situated in Canley Heights is a favourite among Sydney Food Lovers. It brings a hint of Thai and Laos cuisine, and flaunts a beautifully decorated restaurant filled with décor reflecting its culture. It is a rather small restaurant for one that is very popular. The restaurant’s capacity is enough to fit three columns of various seating arrangements, as well as a few group tables stretching further outside. Upon entering Holy Basil, the left side accommodates booth seating for groups of six with comfortable, cushioned teal lounges. The right side is ideal for groups of two, with wooden tables and chairs for seating; although there are a few more group tables along this side. In the centre of the restaurant, a long raw wood table stretches from the front to the back of the restaurant, providing seating for a much larger group, while also separating into smaller group seating. On top of this bench-like table, a golden statue kneels at the very end of the table, immediately capturing the attention of customers and giving a small essence of the style of décor that can be expected around the restaurant. The warm and inviting atmosphere of the restaurant is carried throughout the establishment, with rows of wooden shelves displaying a range of mortar and pestles. Holy Basil’s wooden interior continues to splash itself across the ceiling, where the box frame structure heightens the restaurant and creates a little more space and expansion. Hanging from this structure are various lanterns and light features; some cylindrical and bright red with intricate gold detail around the exterior, and some round and spherical with open, gold-framed diamonds. 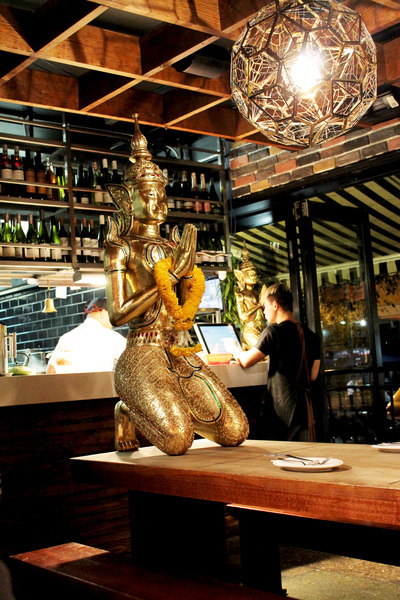 Holy Basil prides itself on showcasing the cuisine that is distinctive to their Thai and Laos culture. Their extensive menu is comprised of dishes that represent the flavours and cooking style of the cuisine, dominated with fresh herbs and spices, and a good balance of sweet, sour and spicy. Rice, noodle and stir-fry dishes that are common in Asian cuisine are prepared according to the traditional and modern flavours and cooking-style of Holy Basil’s heritage. 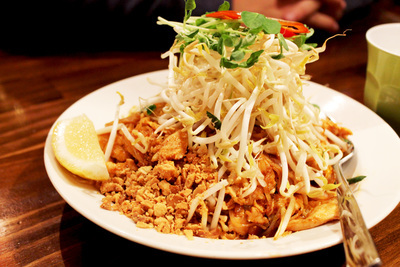 Thin rice noodles, and a mountain of bean sprouts are just two components that make up this Chicken Pad Thai ($13.90). Easily recognised by its orange colour, their Pad Thai encapsulates the sour and hint of spice flavour of the cuisine, and Holy Basil’s version is no exception. With your choice of meat or seafood, this noodle dish is tossed in a crushed peanut sauce with egg, garlic chives and Spanish onions. Finishing off the dish are extra crushed peanuts and a wedge of lemon to squeeze in, together with an extra hint of citrus-sour flavour. If you’re not fond of spice, opting out the chilli will still be just as delicious. 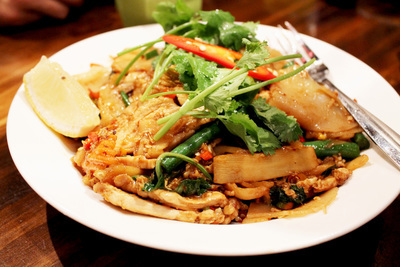 However, if you enjoy the hot and spicy flavour of Thai cuisine, the Chicken Pad Kee Mao ($13.90) would suit you just fine. Its thick, flat rice noodles and large cuts of vegetables match the huge explosion of chilli that the dish brings forth. In addition to chilli, basil, Chinese broccoli, onions and bamboo shoots are also stir-fried with the noodles, before it is garnished with a pinch of coriander. Despite the delicious textures and flavours throughout the dish, it is not one for the faint-hearted; yet chilli lovers will appreciate the heat and spice that is delivered at each bite. Grilled Marinated Lamb Shanks - colourful and tender. For something a little modern, spun with classic Asian vegetables and flavours; the Grilled Marinated Lamb Shanks ($18.90) on the Chef’s Special is one to consider. The lamb shanks are marinated in a special marinade that leaves the lamb with a combination of a sweet, sticky and salty flavour. 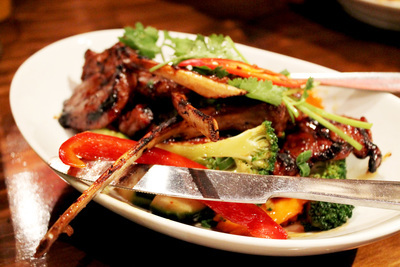 The cuts of lamb sit on a bed of stir-fried vegetables consisting of beans, zucchini, broccoli and capsicum, sparking vibrant colours of green and red throughout the dish. Salt and Pepper Calamari - golden and crispy. 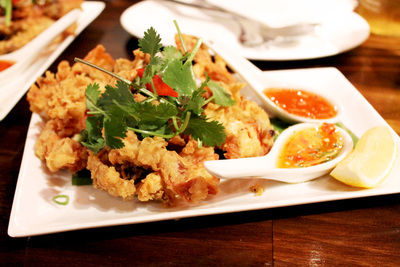 Golden and crispy is what best defines Holy Basil’s Salt and Pepper Calamari ($16.90). Pieces of calamari are lightly coated with a special batter, and are then tossed in a salt and pepper mixture before being fried to create beautifully cooked calamari with a crunchy exterior. The calamari itself is scored with a design and is curled up slightly, sitting on a banana leaf for a little presentation. Served with two kinds of sauces to bring balance to spicy and salty; this dish would definitely be popular among children and adults...perfect to be eaten on its own or with a serving of steamed rice. Soft Shell Crab - no mess from eating this dish. Another crispy and golden alternative comes from a dish that is a little more indulgent - the Soft Shell Crab ($17.90). If you’ve ever had a fear of the mess that comes from eating crab at a restaurant, then fear no more by ordering this seafood dish. The entire crab, meat and shell is cooked in a special batter that leaves the crab incredibly crispy and crunchy, flavoured with salt and pepper, and served with two sauces on the side. With the crab already divided into pieces, Holy Basil offers this elegantly presented and delicious dish that serves as an escape from those who wish to rid of their fear of messy crab eating at restaurants. 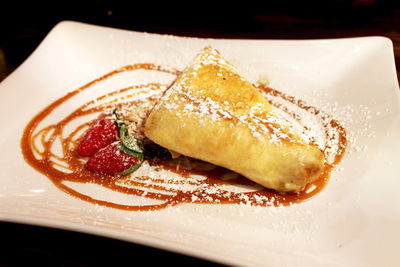 There is no better way to end the meal than with Holy Basil’s famous Fried Ice Cream ($13.90). It is this house specialty dessert that will bring your dining experience to a full circle. Unlike other fried ice-creams, Holy Basil’s version features a triangular vanilla ice cream, wrapped in a thin, delicate pastry before being fried to a golden brown. It is completed with a drizzle of special caramel sauce; coconut crunchies; a few strawberries for colour, and a heaped dusting of icing sugar. Each component of this dessert brings a mouthful of flavours and textures at each spoonful, leaving you satisfied to have had the pleasure of ordering this specialty. You may have heard from word of mouth the standards and expectations of this restaurant; yet visiting Holy Basil will give you the full experience and insight into what you have heard about. You will be astonished at the ambience inside this small Canley Heights restaurant, and you will be pleased with the quality and servings of the dishes that are set in front of you on your table. 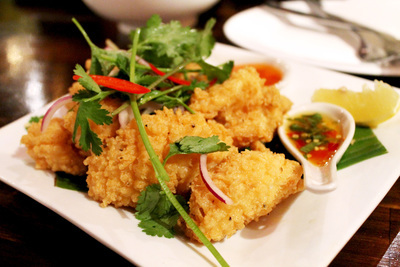 Indulge yourself in the culture of Thai and Laos cuisine here at Holy Basil. Where: Holy Basil, 233A Canley Vale Road Canley Heights NSW. 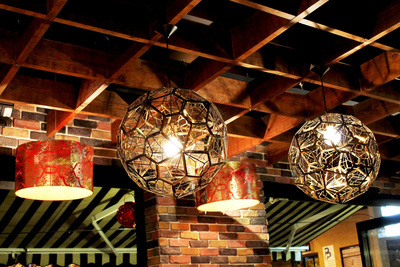 Why: Great food, great environment, and the rumours are true about the fried ice cream. It truly is delicious. Cost: Moderate pricing. Noodles, rice, stir-fries and curries range between $10.90 - $22.90. Mains from $10.90 - $44.90. Salad and Appetisers from $8.90 - $17.90. Dessert from $13.90 - $15.90. When: Lunch from 12-2:30pm. Dinner Sun-Wed 5-10pm, Thurs-Sat 5-11pm.